Download Free Trial of Turn Off Monitor Software Utility Now & Save Energy when you need to keep your computer running, but you do not need monitor to be turned on such as when listening to music only or downloading some big file or downloading music etc. Read More about Turn Off Monitor Software Download. Avoid Glare when you do not need monitor to be switched on. Access all the features of the software download using system tray menu. 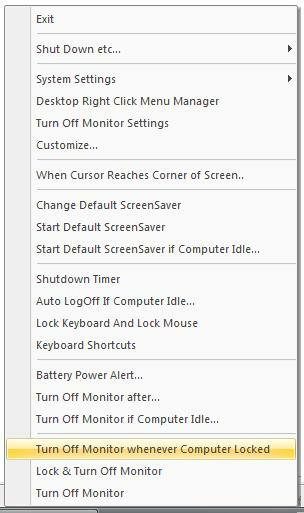 Various Desktop Shortcuts are supported. Turn Off Monitor when using computer / laptop only to listen to music. Keep the Monitor Switched off when running computer only to download music or songs or some other big download. Please do write to us at support@rtsoftwares.com in case you feel that some other relative feature should be there in the utility which can be helpful when listening to music, music download or some other big file download.